A display from an exhibit in the Esther Klein Gallery. The Esther Klein Gallery’s (EKG) mission is to positively impact the cultural life of our West Philadelphia neighborhood and the broader community. EKG programming uses the creative arts as a platform to explore the relationships between art, science and technology. The gallery is home to exhibitions, artist talks, panel discussions, performances and special events. Since 1976, art programming at the Science Center has been a strong and vital force in the community. EKG is free and open to the public. 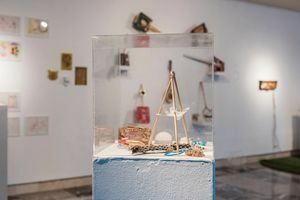 It is supported in part by the Pennsylvania Council on the Arts, Philadelphia Cultural Fund, The Rittenhouse Foundation and The Provincial Fund. Note: The above descriptive information came from the gallery's home page.